Whether to stay onsite versus offsite at Disneyland is a very different discussion than onsite versus offsite at Walt Disney World. I am one of those people who will argue to the death that staying onsite at WDW is better. In Florida, I cannot stand to leave the magic to go off property for any reason. I don’t even want to drive off property to go buy milk, much less drive off to go to spend the night somewhere! I love the Disney hotels at Disneyland, but offsite there is different for me. Here are some reasons why. 1. The offsite hotels are closer at Disneyland. It’s easier to leave the property because the odds are good you aren’t getting in a car. Most of the time you are walking somewhere! When I can walk somewhere, it’s just easier to feel like I didn’t completely leave the magic. 2. Unlike Disney World, Disneyland doesn’t have any value resorts on property. If you are looking for a fun, inexpensive hotel on property, unless there’s a great discount going on, you’re probably just not going to find it. Rack rates at the Disney hotels start at $210 a night for the Disneyland Hotel and Disney’s Paradise Pier Hotel. Disney’s Grand Californian Hotel and Spa starts closer to $280 and goes up to over $500. Those starting prices are off-season, non-weekend prices. With the best discounts running around 30%, you’re still looking at a best-case scenario of $140 a night and that price is hard to come by. 3. The line between on property and off property at Disneyland is very blurred. Some of the offsite hotels are actually closer to the parks compared to the Disneyland Hotel or Paradise Pier. There are several offsite hotels at Disneyland that are literally right across the street. Not right across an interstate, or *within a mile* of the property; right across the street. 4. Several resorts within walking distance have other transportation options. Many have resort shuttles or are serviced by the Anaheim Resort Transit. It starts running about an hour before the parks open and stops about 30 minutes after they close. It’s inexpensive and a good option if your tired feet can’t make it another step. 5. Disney has a relationship with more than 40 of these offsite hotels. They are called Good Neighbor Hotels and if you book a package to stay with one of them through Disney you can get many of the same benefits as guests staying at the Disneyland Resort hotels. Benefits such as Magic Morning Early Admission and Mickey’s Toontown Morning Madness. 6. There are some great hotels in the area. Our first offsite stay was across the street at Best Western Park Place Inn and Mini Suites for $59 a night. The rooms were a bit dark and unexciting but they were clean. The pool is the same rectangular type concrete pool you can find in backyards across the country. It was all we needed though. Other hotels cost a little more but are much nicer. 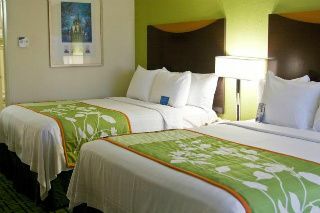 The Howard Johnson Anaheim and Fairfield Inn Anaheim Disneyland Resort are great hotels. I’d stay at either one even if they weren’t right across the street from Disneyland. The picture on the left is a room at the Fairfield Inn. 7. Offsite hotels will often guarantee updated rooms. Disney always reminds their guests that requests are just that – requests. They are not guaranteed. Some of the offsite hotels actually will guarantee an updated room. An updated room in an older hotel can make all the difference. 8. Free Wi-Fi! Many of the offsite hotels have free wireless Internet access! You’ll get this at the Disney-owned hotels, as well. 9. The offsite hotels have “fourth night free” promotions at different times in the year that can help you save while extending your vacation. The Disneyland hotels sometimes run this promotion as well, but you’re starting from a lower price point with most of the offsite hotels if you are trying to minimize your out of pocket expenses. 10. Many of the offsite hotels have free breakfast! That’s something you definitely won’t find onsite at Disneyland, unless you are paying for concierge. The free breakfast is not elaborate at many of the hotels, but it is free and it is something to tide you over until your first Mickey bar of the day. Others, like Embassy Suites Anaheim South, have the same great cooked to order breakfast you find at all their hotels. Now, I do love the Disney hotels at Disneyland. If you can swing it, stay at one of the Disney hotels. All three are within walking distance of the parks and Downtown Disney and as the Unofficial Guide says, the rooms and pools are some of the nicest in the area. I have stayed at all three and there are different things about each one that make them special. Walking out of the Grand Californian into a park? Amazing! The new light up headboards and pool at the Disneyland Hotel? Magical! A theme park view room at Paradise Pier? Perfect! But if those don’t work for you, Disneyland has some offsite options! And good options at that! ← Commando Touring Plans: Value Resorts Are Best! Want to Save Time in Line? Use a Touring Plan! 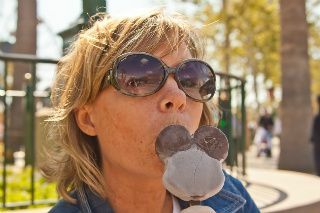 I have been to Disney World several times and have always stayed offsite. Recently I rented a beautiful 3-bedroom condo in Kissimmee that was 15 minutes door to door for the three parks we visited- Epcot, Animal Kingdom and Typhoon Lagoon. Despite some value properties at Disney, the condo was the most economical all around and with the value of the Canadian dollar being so high, was a real bargain for us. Plus, it gives you the opportunity to get away from the crowds, even in the middle of the afternoon; and not having to wait on transit was a bonus. I appreciate your point of view but on-site at WDW isn’t for everyone. Offsite definitely works for some people at Disney World. Personally, I’m not a fan. But I do realize it’s better for some people. I agree. We have a timeshare in Kissimmee which is offsite but not very far that we plan on staying in next summer. Plus we can save money on food and cook some of our own meals. I’m just too cheap to stay on site when you can get such great deals on outside hotels like $30/night on hotwire. I hear you, offsite works great for lots of people at Disney World! Good point – and staying offsite which is so much more affordable allows me to return to Disney World more often – plus we get to do other things in the Orlando area – Universal, Discovery Cove, Cocoa Beach. Orlando and area is much more than Disney World (although don’t get me wrong, I love Disney!). Even though we live in NJ, we’ve bunched 8 of the 16 trips during the past 9 years around two 366-day Annual Pass stints. It has saved us a tremendous amount of money, since besides saving on park admissions, we can stay off-site and not have to pay for parking. We have had great luck at the various Marriott Residence Inn and Springhill Suite properties around WDW, and besides offering free internet and breakfast (big savings), the rooms are larger, and not that far away. Except for MK, we can be at the parking lot in 15~20 minutes from most of the properties. So yes, we’ve stayed on-property (and almost always rented a car), and there are advantages. But off-site has big benefits as well. When we lived in Cali, we would drive down to Anaheim from Monterey for a long weekend. We had a dog, so we stayed at a Red Roof Inn where pets are welcome. It was 3/4 of a mile from the front gates, so it was a nice walk for the dog before she went into the kennel for the day. And it wasn’t too far for the kids (8, 11, 12). Very inexpensive, but clean and comfortable. That’s a great point about being able to bring pets when you’re staying offsite. Isn’t Internet access free (or, rather, included in the “resort fee”) at the three Disney hotels in Anaheim? Regardless, this is a reassuring article. People who aren’t willing or able to fork over $200/per night for a Disney hotel room can definitely enjoy the magic in Anaheim. Heck, I had trouble sleeping one night because the booms from Disneyland fireworks woke me up in a Super 8 that was about a 20-minute walk from the gates. Well, you are absolutely right! I must have had Disney World on the brain for that one. Thank you for correcting that! I stayed at the Fairfield Inn Anaheim earlier this year and really liked it. It wasn’t the cheapest, but it was a nice hotel with a perfect location. I really like the Fairfield Inn, too. It’s amusing how much the rooms look like the rooms at paradise Pier. Exact same color scheme. Another reason to stay off-site at Disneyland is the fact that I think most Southern California tourists are not going soley for Disneyland. There is so much to do in Southern California (i.e. other parks, major cultural attractions,beaches, and major sports)that one is probably better off staying in a more central location. Contrast this to Orlando where many people are going just for WDW as there is so much to do at Disney itself. That’s an excellent point. 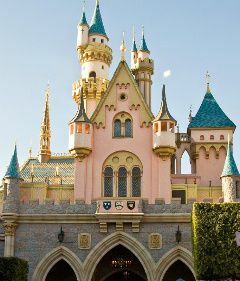 When people visit Disneyland, it’s often wrapped up in a trip to several locations in and around Los Angeles. When I go to Disney World, that’s the only place I go. F*ckin? amazing things here. I?m very satisfied to see your article. Thanks a lot and i’m having a look ahead to contact you. Will you please drop me a mail?